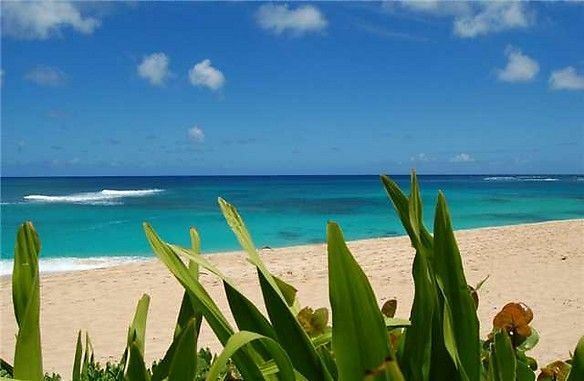 Welcome to world famous Sunset Beach in North Shore Oahu, Hawaii. Settle into your beautifully restored beach house, with 50ft of spectacular white sand beach frontage. Listen as the waves roll in, a gull cries and a gentle breeze stirs the palms. Breath the fresh ocean air after you have strolled down the small lane that leads to a gated driveway, which offers privacy minus the road noises. Watch as surfers catch a ride on the surf breaks of Kammies, Sunset, Rocky Point and Monster Mush. Recently refurbished, Sunset Beach House consists of two separate structures – the front structure being the main home and the back structure being the Guest House. The Main Home features 2 Bedrooms, the master bedroom with a gorgeous queen-size bed, the second bedroom also has a queen bed – and there’s a kitchen, living room and bathroom. There’s also a front deck that allows you to soak in the sun or enjoy the breathtaking views. The rear 2 Bedroom Guest House has its own private entry and offers a kitchenette, 2 x twin beds in one room and a king bed in the other bedroom as well as a full bathroom. The two championship golf courses at Turtle Bay Resort and the historic town of Haleiwa are just a short drive from your holiday home. There is also a grocery store nearby.